VIVACE organs offer incredible performance in a modern yet easy-to-use design. 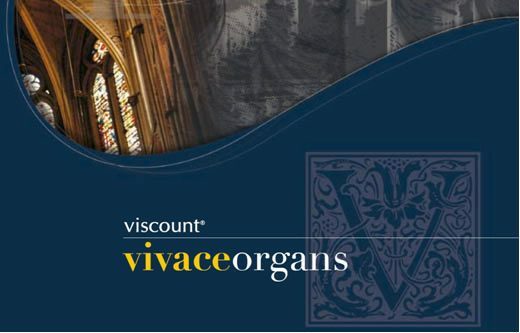 VIVACE instruments faithfully reproduce the sound of the organ with proprietary technology designed by Viscount’s Research and Development labs in Italy. The variety and beauty of timbres are enhanced by an amazing reverberation system, able to recreate a variety of acoustic environments, from a small chapel to the largest cathedral. All models in the Vivace Organ series are highly functional, yet simple to use; a large selection of memories can store and recall your settings; "Organ Styles" preset are completely programmable - allowing you to use the proper organ tone for repertoire from any age. These organs faithfully reproduce the pipe sounds from the world’s most important organ schools. The Vivace organ series is equipped with several preset styles (Baroque, Romantic, Symphonic ...) freely customizable by the user. An extensive library of pipe organ sounds can be found in the internal memory, allowing you to select stops from a large number of choices. The most demanding user can create his "Organ Styles" according to his own musical tastes. You can also adjust the volume of each stop to get a perfect balance. Each division can be assigned to one of several pairs of audio outputs. Vivace Organs have 4 to 6 outputs. Two outputs can be amplified within the organ (optional). All volumes of the audio outputs can be controlled separately and independently from the internal amplification. All your settings are stored in the organ’s configuration. All volumes can be modified and balanced and there are two 5-band graphic equalizers for internal and external amplification.